When we think of charity and giving, many of us tend to think large-scale. We give to organizations; we give to foundations. That is all very good stuff that we should keep doing! Don’t stop that. But many of us also know that we can be in great need of something essential, perhaps a certain medication, an assistive device, or even the right size diapers for an older child. That’s when we hope that someone out there will come through for us – just for us. There are times when picking off one person’s cause at a time just makes sense. I believe this is one of those times. Please consider this short interview with Jeanine K. from Philadelphia regarding her son Nicky. They are well known within the Angelman Syndrome community, and they have an urgent need for safer mobility. Sue: Hi Jeanine. Would you explain all of Nicky’s diagnoses and what daily living is like as far as care at home? S: Okay, so basic living is extremely complicated. I’m thinking, its summer. Families go out, they vacation. How often do you actually get to take Nicky on fun outings? He seems to really love going to activities, and his surf photos are ranking a public favorite. J: He loves to see people and get out, but even with doctor appointments, I have to get him in and out 4 times altogether. It’s hard going there and coming back – especially if my other kids want to stop somewhere. I will sometimes have to sit in the car and eat just so I don’t have to put him in and out again. 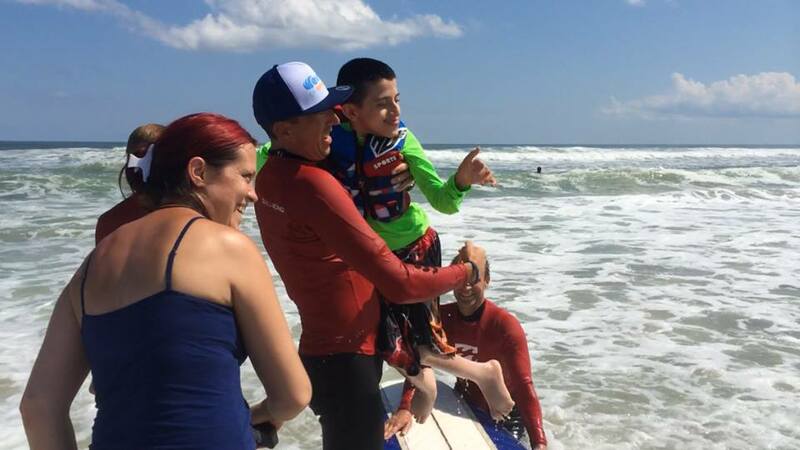 Nicky surfing with the help of Waves of Impact. S: Okay, so I can’t help wondering how you’re feeling about Nicky’s upcoming spinal surgery. Would you tell me a little about his scoliosis condition and why he needs the surgery? J: I’m really scared about the surgery on August 4th (at duPont Hospital in Delaware). It’s 2 surgeries. The first one is anterior where they go in through the front side (where rib hump is at) and deflate the lung to remove vertebrae / disc to make the spine more flexible and reduce curve when they do the second surgery. The second surgery will be to put in 2- 21” rods to hopefully get the curve down to 30 – 40 degrees only . It is a big surgery and since he isn’t mobile, the recovery might be more difficult -especially with having to lift, carry, and move him. S: My daughter had spinal surgery (Angelman Syndrome related). But I had no idea how complicated a surgery Nicky is facing. I don’t have the words. But I want to thank you for doing this interview to make others aware of the challenges Nicky is facing. I’m keeping this short because I know you have a lot (extra) to consider right now. I really hope the surgery goes smoothly and that all needs are met in a timely fashion for you and Nicky. Jeanine’s vehicle does not fit the criteria for a lift modification. A special lift van is needed for safer (and easier) transportation. At some point in any fundraising, the friends and family get maxed-out. 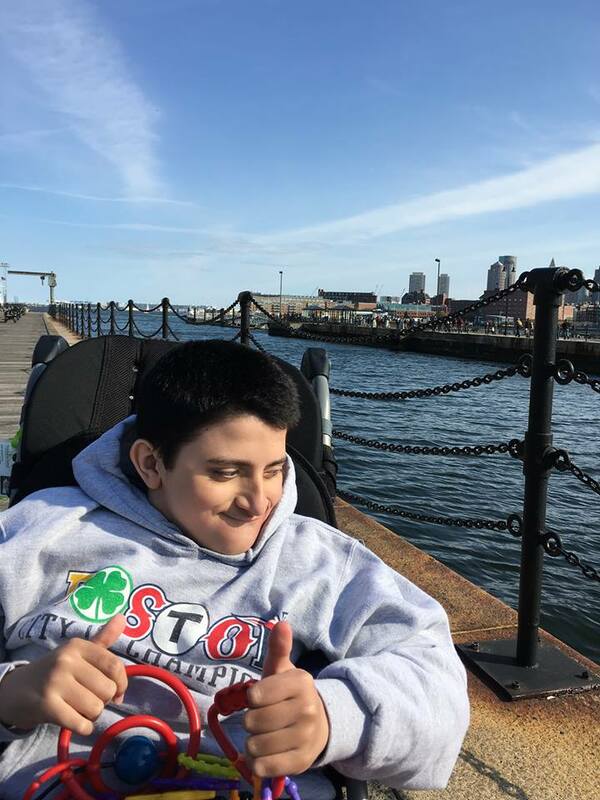 So if you are moved to help Jeanine and Nicky, please visit Love Carries Nicky on Facebook where you may click a link to his fundraising page, view video coverage of his story by Fox29, and more. Follow and share #LoveCarriesNicky on Facebook and Twitter. Thank you!